There are so many great photos on social media today from last night’s “All the WOO in the World: An All-Star Celebration of Bernie Worrell,” an all-star concert to help raise funds/express appreciation for the musician, who is battling stage-four lung cancer. Such great sentiment, since so often people don’t express their appreciation for others until it’s too late to tell them. When artists are memorialized in the press after their death, I have often wondered if they realized when they were still alive that they were so valued. Click here to learn more about the fund set up to help Bernie Worrell with medical expenses. My fascination with Australia started in third grade when I really wanted to go hug a koala bear. Although I’m not much of a collection person, I did seem to accumulate many koala stuffed animals around that time. I still have never been to Australia but my RS crush continued my fascination with the country (and I enjoyed seeing the beautiful country through Wiggles videos, too, when my kids were younger). Anyway, RS was recently in Australia to promote “Ricki and the Flash,” which opens there on Aug. 27, so I’ve enjoyed watching some of the promotional interviews there (and listening to the accents). One thing in particular that’s interesting is how the questions differ from the American interviews because of the circumstance – these include his fame in Australia in the 1970s, why he hasn’t toured in Australia since he found success in America and that they forgive him for cancelling last year’s tour because he was filming “Ricki and the Flash.” He also told the interviewers that they are planning to tour in Australia next year. Here are some of my favorite interviews from his recent visit. 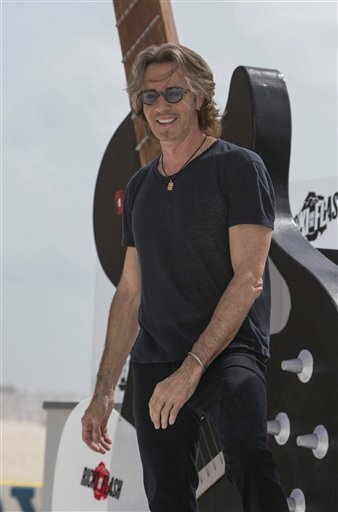 The Fix: “Rick Springfield on his Aussie roots, his ’80s lowpoint and rocking with Meryl Streep in their new movie” (click on photo for interview). 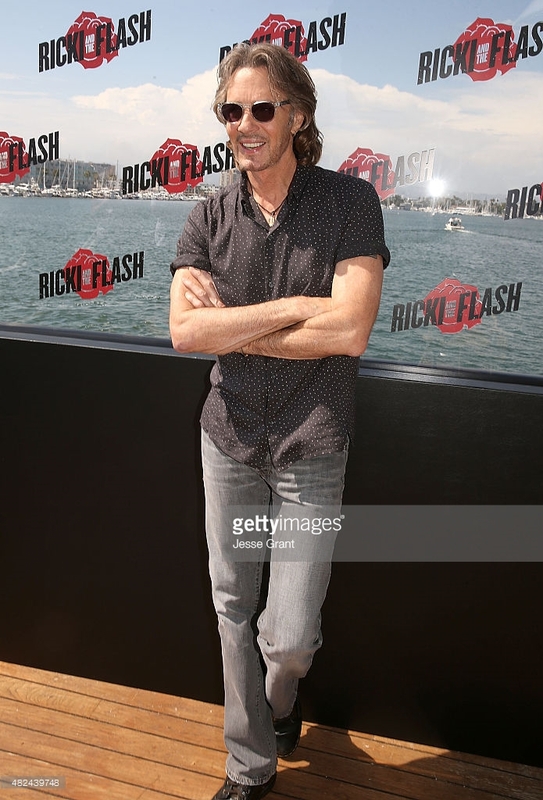 I attended an advance screening of “Ricki and the Flash” tonight (not THE premiere in New York, but one in Phoenix). I was already a big fan of Meryl Streep, Kevin Kline and Rick Springfield (obviously the last one) and the mix of all three of them together – along with a storyline of music and family comedy-drama, I knew I would like it even before walking into the theater (or, to be more precise: before checking in my cell phone and getting wanded before walking into the theater; no photographing allowed during the movie – duh – sad that adults just can’t be trusted to not film a movie in a theater). 1. Meryl Streep learned guitar for the movie. I really admire the way she jumps into her roles and learns new skills for her films. 2. RS plays the guitar – a Gibson SG- that he wrote “Jessie’s Girl” on. The script called for one and he had one so he played his own. Serendipity! What I wish I would have known before the movie – bring tissues. I realize I may be oversensitive – I used to tear up at Hallmark commercials back in the day when you couldn’t fast-forward past commercials – but it was kind of an emotional movie for me, lots of tears. All the family drama, regret, unfulfilled dreams, failed relationships. Plus tears of joy, too, with the happy moments in the film, as well as being thrilled that RS had such a great role! During the opening credits, somebody next to me commented when RS’s name came on the screen, “Rick Springfield is in this? !” which I just found hilarious considering how much I’ve been hearing about the movie lately. Between this film and his recent role in “True Detective,” I hope that when his new album comes out in January (or whenever it finally comes out), it will get a great deal of positive recognition, too. Oh, and this was a fun start to the “Ricki” week, too – a video Q&A with RS on a radio station’s Facebook page, with RS answering in video replies to fans’ questions.